An Arianespace Ariane 5 rocket lights up the night sky during an Aug. 6, 2011 launch from Guiana Space Center in Kourou, French Guiana. The rocket launched the new Astra 1N and BSAT 3c/JCSAT 110R satellites into orbit. Loaded with European and Japanese television broadcasting satellites, an Ariane 5 rocket blasted off in a ball of fire Saturday (Aug. 6) from the South American jungle and successfully deployed both payloads less than an hour later. The 165-foot-tall rocket ignited its hydrogen-fueled main engine at 2252 GMT (6:52 p.m. EDT), then roared skyward seven seconds later when the launcher fired its twin solid rocket boosters. Liftoff occurred after dusk at the launch site in Kourou, French Guiana. 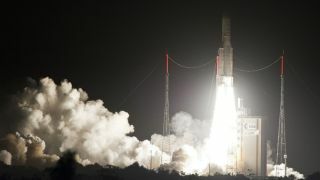 Arianespace, the French company overseeing the launch, postponed the mission from July 1 to replace a hydrogen valve in the rocket's first stage. An anomaly with the valve scrubbed the flight's first launch attempt. Unfavorable upper level winds delayed the launch about one hour Saturday. The rocket's second stage injected both payloads in the planned oval-shaped elliptical geosynchronous transfer orbit, then released the satellites a few minutes later. The 11,750-pound ASTRA 1N spacecraft, a satellite for European operator SES ASTRA, separated first about 27 minutes after liftoff. The Ariane 5 rocket's upper stage deployed Japan's 6,415-pound BSAT 3c/JCSAT 110R satellite 38 minutes into the flight. The BSAT 3c/JCSAT 110R satellite, a Japanese craft jointly owned by two companies, rode the Ariane 5 rocket in the lower position inside the vehicle's nose cone. The spacecraft is designed for a 15-year tandem mission for two Japanese communications firms. Known as BSAT 3b and JCSAT 110R, the satellite was built by Lockheed Martin Corp. based on the A2011A platform. The BSAT 3b/JCSAT 110R satellite is heading for an operational position in geosynchronous orbit along the equator at 110 degrees east longitude. It carries 24 Ku-band transponders split between its two operators. Arianespace's next launch is set for early September with the Arabsat 5C and SES 2 commercial communications satellites.